Biocontamination refers to biological contamination of products by bacteria and/or fungi, as well as the toxic by-products of these micro-organisms, such as endotoxin and mycotoxins from Gram-negative bacteria and fungi respectively. When designing a biocontamination control strategy, which is based on the manufacturing process, there are three components to consider, each of which requires risk assessment: 1) designing process systems to avoid contamination; 2) monitoring process systems to detect contamination; and 3) reacting to contamination events with proactive measures. Process systems design is where maximum effort should be placed. 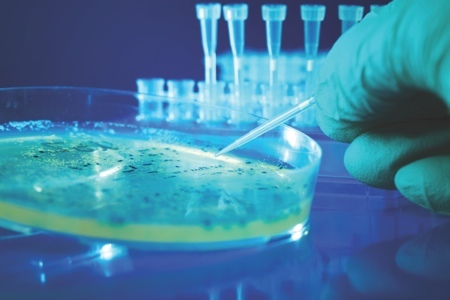 Although often overlooked by some laboratories, the international standard on biocontamination control, ISO 14698, is an important resource for the development of a biocontamination strategy. 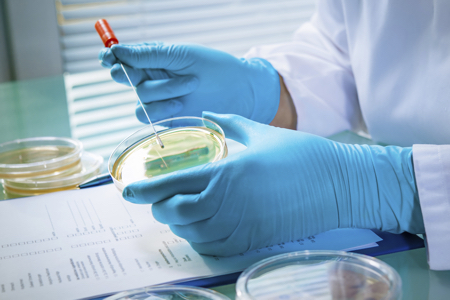 There are two parts to this standard: Part 1 covers general principles and methods of biocontamination control; Part 2 covers the evaluation and interpretation of biocontamination data. Both parts of ISO 14698 are currently undergoing revision. It is important to clarify the distinction between ISO 14698 and the cleanroom standard ISO 14644. ISO 14644 is a 12-part cleanroom certificate standard that is focused on airborne particulates. This standard covers cleanroom design, high-efficiency particulate air (HEPA) filter specification, pressures, and how to monitor a cleanroom to assess the cleanroom class. ISO 14698 focuses on the ongoing assessment of cleanrooms for viable contamination. Despite good design and following available guidances, cleanrooms are at risk from several sources of contamination, people being the greatest. Some studies estimate that people can contribute up to 70% of micro-organisms found within a standard cleanroom. The second key source of contamination is water, which not only allows contamination to spread, but also helps micro-organisms to grow. Micro-organisms are carried in air streams until they are deposited on a surface. Unless they have recently been disinfected, most surfaces will have contamination on them. The risk arises when the contamination moves from a less critical to a critical location, so it follows that using clean utensils and clean gloves is very important to minimise contamination transfer. Contamination control: To minimise contamination from people, appropriate gowning that curtails the shedding of skin matter and micro-organisms is essential. Localised protection, such as isolators and unidirectional airflow cabinets, should also be established around the product to minimise contact with people. Good cleanroom design covers the use of HEPA filters, pressure cascades and air distribution. Cleanrooms must also be cleaned and disinfected regularly, and transfer of items in and out of the cleanroom must be controlled. Once good design principles are in place, an environmental monitoring (EM) programme should be designed to provide information about the state of control of the facility. It is important to note that EM does not replace good environmental control (the design of cleanrooms and operational practices); EM provides only a ‘snapshot’ in time. Individually, counts are rarely significant, but the trends over time are important: increased counts, frequency of incidents and microflora. For example, the presence of microflora, such as waterborne bacteria or organisms that are hard to kill with disinfectants, may indicate the breakdown of control. The international standard ISO 14698-1 can assist in the development of an EM programme. Programme development involves asking a series of questions, each of which requires a risk-based response. Not everything can be monitored and therefore consideration must be given to when and why monitoring should occur. When developing a programme, the sampling plan should take into account the cleanliness level required at each site to be sampled as well as which types of samples are appropriate (air and/or surface samples). The plan should also define whether this is a quality control activity or an activity delegated to production. Additionally, it must be determined how to trend the data and how to set limits. Sampling types: The measurement of airborne particle counts is a key part of environmental control. Airborne particles are measured using optical particle counters, whereby air is drawn through the instrument and passes a laser. The laser calculates the number and size of airborne particles present. In pharmaceutical production, there is either one or two particle sizes to look at, depending upon the region of the world. The US Food and Drug Administration requires particles that are of equal or greater size than 0.5µm from 1m3 of air to be counted. In addition to this requirement, EU GMP also requires the monitoring of particles equal to and greater than 5µm. The reason for the 5µm size requirement is that this is close to the size of a skin cell – the most common type of contamination floating within a cleanroom. The limits will be according to the class of cleanroom, and out-of-limits particles may indicate a problem, for example with an air handling system. Viable monitoring methods use either a general purpose culture medium, such as tryptone soya agar (TSA), at a dual incubation regimen of 20–25°C followed by 30–35°C, or two different culture media (one of which is selective for fungi, e.g. Sabouraud dextrose agar, SDA) and which are used at two different temperatures. Importantly, the choice of culture media, incubation times and temperatures all require assessment and validation. 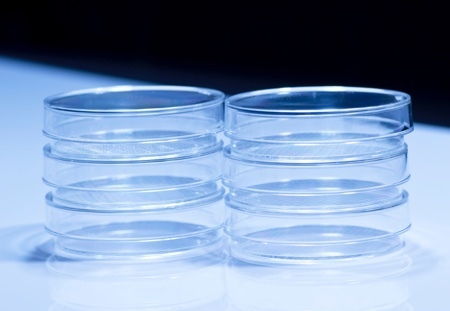 There is no clear regulatory guidance on which agar to use, and for how long to incubate. It is also important that before use, each lot of culture media must be verified and compared with the manufacturer’s certificate of analysis. There is a requirement to monitor different surfaces, either those close to the product that may indicate contamination, or other samples to indicate cleaning and disinfection efficacy. Surface monitoring includes testing these various surfaces, including product contact surfaces, floors, walls and ceilings, for micro-organisms. The two common methods used are contact plates and swabs. In general, contact plates get better recovery; however, swabs are frequently used for curved and thin surfaces, such as a window frame. The culture media should ideally contain a suitable disinfectant neutraliser to reduce the risk of disinfectant residues that remain on surfaces. Air monitoring methods include active air samplers and settle plates. Active air samplers generally fall into three designs, which affects how they collect airborne particles: still to agar, membrane filtration, and Anderson impaction. The standard requirement is to sample one cubic metre of air and capture the micro-organisms onto an agar surface. It is important to know the particle collection size efficiency of an air sampler, known as the D50 value, as well as the biological collection efficiency. Settle plates, in contrast, detect micro-organisms that fall out of the air due to gravity. They are useful when placed in the right location, especially within the unidirectional airflow cabinet, and smoke studies are useful for helping to select the best locations. Settle plate results are typically expressed as the number of micro-organisms collected per time of exposure. Care must be taken when using settle plates because they are quite easy to cross-contaminate, especially in grade A or ISO Class 5 conditions. 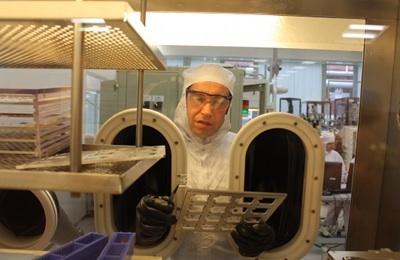 Sampling locations: The monitoring plan should also note the choice of sample locations based on the nature of the work to be carried out and the impact that cleanroom operators and equipment (both fixed and portable) will have. Using a risk assessment tool such as Hazard Analysis Critical Control Points (HACCP) helps to construct workflows. Through these workflows, the areas of greatest risk can be pinpointed, the appropriate sample types and locations can be selected, and the basis of a sample map can be formed. Sampling number, time and frequency: Next, the number of samples to be taken during a production run can be determined. The time of sampling should also take account of testing after a ‘cleandown’ testing at the end of a shift, testing at times of highest operator activity or high levels of materials in the area. The frequency of sampling should be assessed based on a risk management approach. Factors to consider may include room activities, product exposure risk, room temperature, process stage, duration of process activities and water exposure. To identify patterns and possible reasons for a given trend, it is useful to include appropriate information with tables and graphs. Such information includes locations, dates, times, identification results, changes to room design, operation of new equipment, shift or personnel changes, seasons and HVAC problems (e.g. an increase in temperature). It is also important to regularly profile the micro-organisms found during environmental monitoring, some of which must be speciated using identification techniques. The species should be profiled regularly for changes in profile, the presence of unexpected or ‘objectionable’ micro-organisms, and cross-comparison (e.g. comparing surfaces to people or differently graded cleanrooms). There are some issues with the existing standard, particularly how it fits in with EU GMP and FDA guidance documents (e.g. guidance on aseptic filling). There is also a lack of working examples for constructing an EM programme. Additionally, rapid microbiological methods, such as spectrophotometric counters, are not included. There is therefore clearly a need for a revised standard – a process that has been ongoing since January 2013. It is important for industry to contribute towards this process. The MAS-100 family of air samplers (Merck KGaA, Darmstadt, Germany) is specially designed for monitoring microbiological contamination in aseptic production areas and isolators with the rigorous requirements of the pharmaceutical industry. All MAS-100 instruments are tested and designed to ISO 14698-1 annex B (guidance in validating air samplers). The MAS-100 instrument family was recently independently validated according to this international standard. The test facility incorporated a cleanroom with a volume of 20m3, and a 10-minute flush of clean, horizontal flow of clean air after sampling. The setup allows for quick turnover of the room between bacterial aerosol challenges. 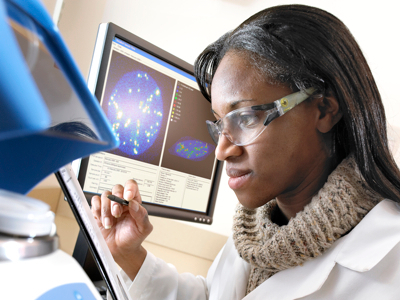 There are two critical factors in air sample validation: physical efficiency and biological efficiency. Suspensions of washed Bacillus atrophaeus spores (NCTC 10073) in distilled water were prepared and used as the source in physical and biological efficiency testing. Suspensions of spores (1 x 105 colony forming units (cfu) per ml) in 0%, 0.007%, 0.07%, 0.7% and 7% of potassium iodide (KI) in 80% aqueous ethanol were prepared for use in the physical efficiency testing. The B. atrophaeus solution was then dispensed using a spinning top aerosol generator (STAG) to produce an aerosol of controlled particle size. This calibrated instrument can determine the actual amount of particles captured with high accuracy. Physical efficiency: For the physical efficiency testing procedure, membrane filtration (dia. of 80mm, pore size 0.8µm) was used as a reference method. The filtration system was connected to a vacuum pump and flow was regulated by a mass flow meter. The reference method membranes were then transferred to gross medium and incubated for at least 18 hours at 37˚C before examination. 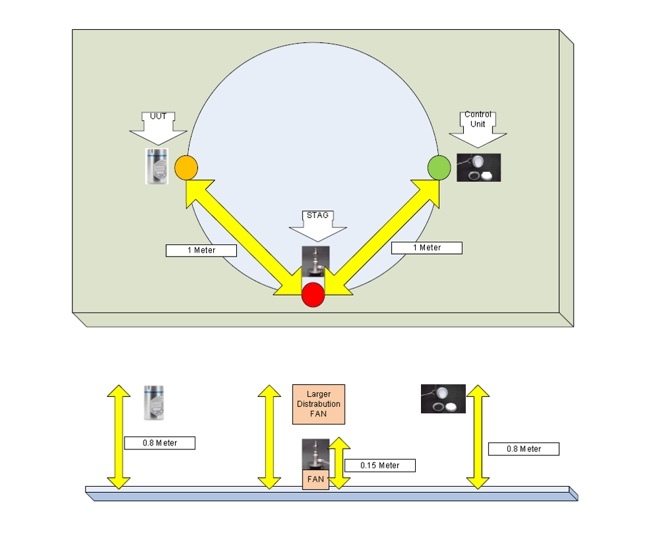 The MAS-100 air samplers and the reference method equipment were equidistant from the aerosol generator to ensure consistency in sampling, and appropriate distribution of the bioaerosol within the environment chamber (see Figure 1). When evaluating physical efficiency, the impaction speed of the air sampler is an important parameter. 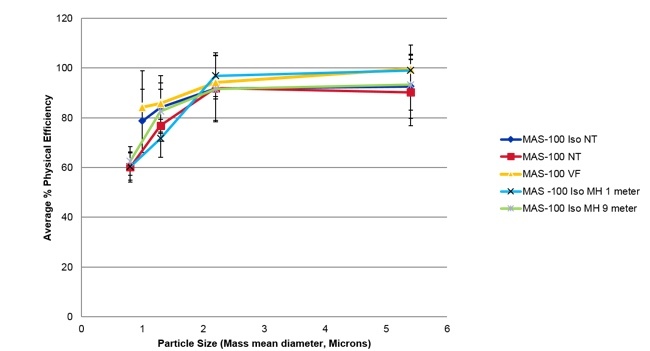 The speed should be high enough to aspirate particles down to 1µm, and should be adapted in such a way that viable particles are not damaged when they are impacted on the agar plate. Also, physical efficiency is the same, whether the particle is a micro-organism, carries a micro-organism or is an inanimate particle. All validated MAS-100 instruments perform similarly across the range of the portfolio (see Figure 2). The MAS-100 family performs well above the D50 cut-off value according to ISO, and becomes even more accurate as the particle sizes increase. Since all the air samplers have a standard flow of 100L/min, these data support using a variety of MAS-100 systems in various applications while maintaining consistency in results. Biological efficiency: For biological efficiency testing, a three-jet Collison nebuliser (manufactured by Mesa Labs) operating at a pressure of 26 pounds per square inch (psi) was used to generate the mixed microbial aerosol. The spray suspensions were made up using a stock 105 sterile aqueous dilution of the B. atrophaeus spore suspension and suitably diluted recent liquid culture of Staph. epidermidis. After the bacterial solution was prepared, the nebuliser was placed in the controlled test chamber. The biological efficiency testing was carried out in a Class III microbiological safety cabinet that allows for greater aerosol control during testing. Because of the nature of cultured micro-organisms, biological efficiency results are typically lower than physical efficiency results, leading to extra control measures being put in place. 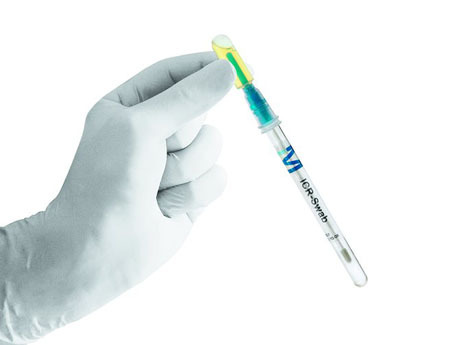 The biological efficiency of the MAS-100 range was compared with a commonly used reference Instrument method. Table 1 contains the results of each type of MAS-100 instrument that was tested, and their corresponding biological efficiency results. These results support the ISO statement that there should be a compromise between the ability to collect particles (physical efficiency) and recover viable micro-organisms (biological efficiency). These results indicate great recovery, even at an accelerated impaction rate over the reference method. 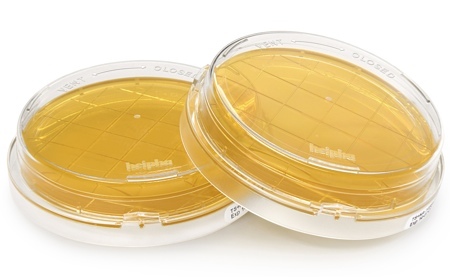 Selecting an agar plate: According to ISO 14698, certain criteria should be considered when selecting an appropriate growth medium. It should be a broad, non-selective medium, with appropriate additives or neutralisers to minimise antimicrobial activity of disinfectants or antibiotics. It is also important to evaluate the packaging of the plates used, depending on the level of cleanliness expected in the sample area. Using double- or triple-wrapped plates can help. In addition, it is recommended to use internally sterilised media (gamma-irradiated) in aseptic areas. The agar should contain the right neutralisers for the intended application, whether the objective is to neutralise vaporised hydrogen peroxide, disinfectants, or overcome antibiotic activity from residual products. 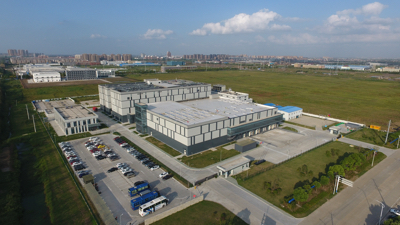 Following incubation of the sample plates, the colonies of the reference media and ICR media (Merck Millipore), in combination with the MAS-100 air samplers, were evaluated. Merck Millipore states that a third-party laboratory reported both larger colonies and good morphology, and also noted that the strains grew slightly faster using ICR media. In conclusion, the international standard ISO 14698 can serve as a resource for laboratories when developing a biocontamination control strategy, which should focus on product quality, efficacy and patient safety. 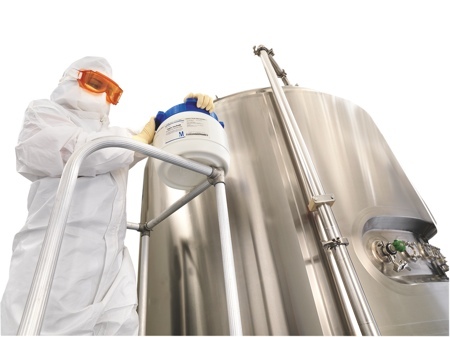 Environmental control, or the design of process systems to avoid contamination, is the most important component of any biocontamination strategy. EM is useful to verify environmental control. A successful EM programme must identify and encompass all the possible sources of contamination, (people, air, surfaces and water spillages). EM data should be reproducible, taking both physical and biological efficiency into account. The selection of high quality media also has an impact on the quality of EM results. 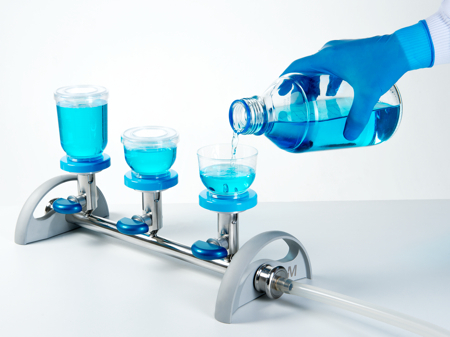 The combination of instruments and media chosen must be designed for different clean environments, and the instruments selected for each area should be matched to give the same result using the same media so that easy baseline measurements can be achieved. Tony Ancrum, Global Product Manager for Viable Air Monitoring, and Anne Connors, Field Marketing Manager, Merck Millipore.